What happens in the NHS in the UK matters to nearly all of us. Our health, and that of our families and friends, is in its hands. Then there’s our working life: many psychologists have professional and academic healthcare roles. The NHS is much-loved but there is little doubt it is under strain and operating in changing times: so how can it make the most of innovative technologies such as genomics, digital medicine, artificial intelligence and robotics to improve service? The NHS (via Health Education England), aware of the potential benefits and challenges of new technologies and their demands on healthcare practitioners, commissioned a review led by US cardiologist, geneticist and digital medicine researcher Dr Eric Topol. Literature reviews, expert opinion and focus groups informed the review. Major digital technology trends were considered, with their implications for services and staff training. February 2019 saw the publication of the Topol Review1, alongside a supplementary report exploring the digital future of Mental Healthcare. What did the Topol Review conclude? The reports set key considerations for the healthcare ecology, emphasising that the patient must be at the centre when new technologies are being introduced; that applications are clinically validated; that patients should ‘opt in’ to their use; that efficiencies from technology use should enable more time for the clinical relationship; that the workforce will require a wider cross-disciplinary mix, for instance, including computer scientists; and that workforce education must prepare all staff for technological developments. The reports further emphasise that with the introduction of new technologies, ethical and other implications need to be considered. The NHS must address patient safety, data governance, the potential for dehumanisation of care, the health and socio-economic inequalities impacting on accessibility of new technologies, and must encompass the needs of patients, carers, healthcare staff and organisations. Within this thoughtfully considered framework, the Review proceeds to map the digital healthcare future. That’s no easy task: technological changes are not always predictable, smooth, or welcome, and they sometimes unleash the unexpected. Some of these digital transformations are already with us, albeit many still in piecemeal form. The NHS has begun to use electronic health records (EHRs), picture archiving (in radiology for instance), information sharing through secure cloud-based patient medical records, and various devices enabling self- and remote monitoring and reporting of physical and mental health states (telemedicine). The Genomic Medicine Service offers whole genome sequencing for people with certain rare diseases, and a major study of NHS patients, the 100,000 genomes sequencing project, has recently achieved its target and will use the sequences to identify new and rare diseases and cancers, linking the genetics to intervention outcomes and other information, making healthcare more personal. Virtual and Augmented Reality, Big Data (very large dataset) analyses, Artificial Intelligence (AI) and machine learning applications have also entered UK healthcare. Patient digital services too are increasingly available, including access to their GP records, booking appointments, obtaining repeat prescriptions and viewing pathology test results. There is an abundance of information about health conditions and their management on the internet, not all quality-checked. 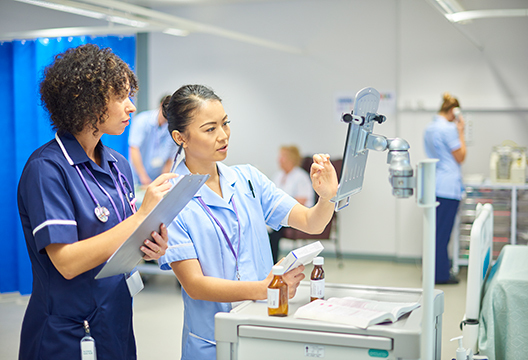 Training initiatives covering the use of digital technologies have been introduced to support clinical innovations and new roles in NHS organisations, and courses at master’s degree level offering qualifications in Healthcare Informatics are widely available. Where does Topol lead us from here? The advances will come through three overarching technology groups identified for physical health: Digital Medicine, Genomics, and AI and Robotics. The Mental Health groups differ somewhat: Digital Medicine, Genomics, and Systematic Data Recording, Processing and Sharing. Each group in turn encompasses multiple higher order technologies: to give just three examples, sensors and wearables for diagnostics and remote monitoring, speech recognition and natural language processing (NLP), and automated image interpretation using AI. Specific applications are detailed within these categories in the report, reflecting the diversity and depth of physical medicine practice and the narrower but important focus of mental health, especially its language-based practice and data-rich records. From a psychological perspective, the interplay between mental and physical health means that what happens in each domain can be relevant to the other: identifying a genetic risk for an individual will have psychological ramifications, or people with depressed affect may not adhere to treatment for their diabetes. Psychologists will need to straddle the divide. One illustration among many possible, relevant to both physical and mental health, is the introduction of EHRs (see recent British Psychological Society Guidance2). Alongside the development of speech recognition and NLP for record content creation, these developments could radically change the way we record what we do. In addition to its basic role in documenting a clinical history, the EHR is integral to clinical practice. It is the source of information for coordinating ongoing and future care, as well as providing information about outcomes, management information and information for research. It is also a source of large data sets that will provide the grist for artificial intelligence and a variety of machine learning applications. On the negative side, there is evidence3 that poor quality records can be a major factor in patient harm and deaths. Such consequences impact on families as well as leading to punitive professional and financial consequence for practitioners and organisations. Completing EHRs can impose heavy demands on practitioner time. This may be particularly relevant in pressured, high risk contexts. There is already evidence of inappropriate practices such as cutting and pasting tranches from one part of a record to another, leading to bloated records that are then hard for others to navigate. The pressures have also led to questionable and costly ‘innovations’ such as the use of remote scribes – medical students and practitioners in India for instance – to populate US clinical records from information dictated into digital files by stressed physicians. The significant negative impact on physicians in the US of having to work with EHRs includes serious personal and emotional consequences, graphically detailed in Atul Gawande’s recent New Yorker article ‘Why Doctors Hate Their Computers’4. In mental health practice, creating record notes from a 45-minute session of verbal, often emotive, interchanges, can also be pressured. It is no surprise, therefore, that speech recognition technologies and NLP will be very welcome, although not a total solution for clinical practice. The ability to create content by talking (rather than entering on a keyboard) is appealing, even if time still must be spent checking the output. The introduction of structured EHRs – already in development – will help. A further issue is coding the information to enable computer analysis of record content for different purposes. Clinical term coding systems such as SNOMED are available, but the complexity of medical content requires ensuring that coding properly matches the intention of the practitioner. Here again, through AI/machine learning, systems could be developed that take account of usage context to facilitate accurate coding (Topol 2 p.6). The same technologies can also be employed to read digital images (being developed for clinical analysis of digital retinal scans for instance). Expert systems based on such technologies, as part of EHR system functionality, will become available to aid diagnosis and treatment selection. Within mental health, the use of speech recognition readily lends itself to automatically introducing speech-rich interaction content in the record. Simultaneous speech content analyses could then detect important mood changes and the presence of suicidal intent – the latter already the subject of ongoing research using social media postings5. NLP could in the longer term transcribe conversations, capture the sentiments of participants and summarise the content [Topol MH p.17]. Further instances of the nature and impact of the other new technologies are given in the Topol Reports. Over many decades now, psychologists have been developing digital tools to meet healthcare needs, providing information resources, assessments, treatments and other applications. They have adapted as technologies such as virtual and augmented reality have become increasingly sophisticated, connected and integrated into the daily living of users. The ongoing digital revolution and its impacts in healthcare (and elsewhere) also constitute a psychological revolution – such developments almost invariably involve significant transformations of thinking, actions and feelings and their interactions as well as relationships with technologies, and much else. Psychologists will need to enter their practice ‘digitally empowered’. Then there are further opportunities and challenges in applying psychology to the creation of new technologies and in developing applications and adaptations that exploit the benefits these can bring. Psychologists can make tech relevant to peoples’ needs, identifying harmful psychological impacts and, if necessary, arguing for modification or its removal on psychological grounds. The digital future is thus also a psychological future, with potential benefits for all using healthcare services. Judging by the past, the future will bring opportunities for both innovative psychological applications and wider psychologically-informed roles in healthcare. - Michael Berger is Emeritus Professor of Clinical Psychology at Royal Holloway, University of London. He is also a recipient of the Lifetime Achievement Award from the British Psychological Society’s Professional Practice Board.